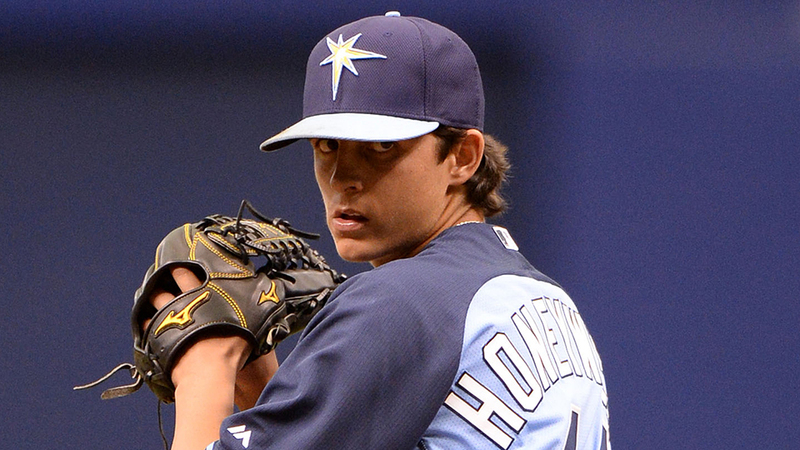 Rays right-hander Brent Honeywell isn't afraid to aim high. "To me, every night I'm trying to throw no-hitters, perfect games," the 20-year-old said. "That's what pitchers strive for. We don't want to get hit around." In just his third full-season start, the Rays' No. 7 prospect came within four outs of his first pro no-hitter. History ultimately wasn't on Honeywell's side, but he did come away with his first Midwest League win in Class A Bowling Green's 8-0 victory over Dayton in Wednesday's doubleheader opener. Honeywell (1-1) -- whose signature pitch is his family-taught screwball -- allowed just one hit while striking out seven over six innings. He dropped his ERA to 1.13 through three starts. Over 16 innings, he has amassed 22 strikeouts and six walks. The Rays' 2014 second-round pick sports a 1.09 ERA ERA with 62 strikeouts in 12 career appearances spanning 49 2/3 innings between Bowling Green and Rookie-level Princeton. The right-hander got two outs in the sixth inning before the Dragons picked up their first hit. Second baseman Ty Washington did the damage, driving a line-drive single into into center field. Honeywell retired Narciso Crook on a flyout to left in the next at-bat, completing his day having faced two over the minimum. Despite the results, the Carnesville, Georgia native was agitated by his fastball command early in the game. The right-hander struggled locating the heater to his arm side. He relied more heavily on his offspeed pitches -- the screwball, a changeup and a fast-improving curveball -- until his fastball came around in the fourth. "I don't know, something was a little different," Honeywell said. "But I was missing barrels, and that's a good thing." The screwball is Honeywell's go-to pitch, but he improved his changeup dramatically in 2014 and has set out to do the same with his curveball this year. The breaking ball was effective for him Wednesday. "The curveball was really good. I got a couple punchouts on that," Honeywell said. "I'm throwing it for strikes, throwing it for punchouts. That curveball, I always say it goes back to my dad. He had me throwing it all offseason, and I started shaping it a bit in Spring Training. It's coming together a little bit." The Rays are high on Honeywell for a number of reasons, but his personality is probably high on the list. Favorable traits include being very coachable, taking bits and pieces from anybody willing to bend his ear. Though he's five rungs down the ladder from the Major Leagues, he's actively sought wisdom from big leaguers Chris Archer, Nate Karns, Alex Cobb and especially Matt Moore. "I talked to [them] about it a lot. The higher you go up, the more disciplined these hitters are," Honeywell said. "I've watched it a lot, saw it some in Spring Training, where a big leaguer will come down and get hit a lot by Minor League guys. These Minor League guys like to swing the bat. "They swing where I'm at right now and you better be able to make pitches. That's why I like throwing offspeed pitches in fastball counts. That's why I like doing that stuff. They swing the bat. They want to hit." Honeywell said he's already noticed a difference between Appalachian League and Midwest League hitters, and he's interested to see how the competition compares as he ascends up the system. "As you climb the ladder, you see guys who are more disciplined and won't swing as much," Honeywell said. "That's one thing I noticed in Princeton. They're free swingers down there too. Here, they're a little more disciplined, especially behind in the count. "In Princeton, you throw a 2-0 changeup down, they would swing through it. Here, some guys are just going to spit on it. That's causing me to really pitch now, and I love it. That's what I want." Honeywell said his no-hit bid was bailed out by a pair of slick defensive plays. The first was by center fielder Thomas Milone, who tracked a rocket from Dayton's Aristides Aquino to the warning track and made an over-the-shoulder grab. The other gem was a leaping grab by first baseman Casey Gillespie in the fifth to rob Jimmy Pickens of a likely extra-base hit. "It was a hanging screwball and it was a missile," Honeywell said. "[Gillespie] jumped and caught it. I jumped with him, tried to help him." In Game 2, Bowling Green again shut out Dayton, 1-0. Right-hander Greg Harris scattered four hits and struck out five over six innings.